This frequent disconnect is the only issue I have really - speed is generally fine except for a few offshore sites - but that is likely congestion elsewhere. OK I changed my HONT twice last week as Snap suspected I had a faulty HONT. Also tried a new 7390 Fritzbox and also a 7340. After all this still no good, I still had the dropouts during downloading. Left it back with Snap! Came home last night and dropouts were the worst they have been, 12 dropouts in 20 mins. I sent the logs to Snap. VoIP phone dropped out, Netflix stopped streaming. Terrible. Today I have switched back down to 100/50. Happy to say my connection is back to normal, zero dropouts during downloads. 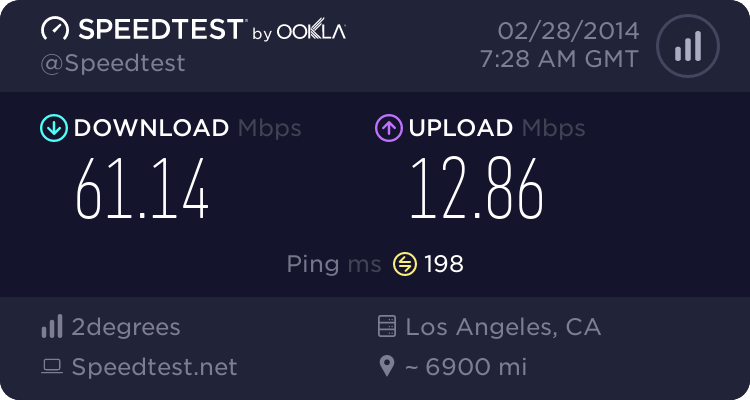 I also consistently get the full speed on speediest, I found the 200mbps service quite erratic, I was literally getting 200mpbs one speediest and 60mbps the next. Snap have some work to do on the 200/50 for sure but that's why it's a trial and I knew that when I went to the 200/50. I'm sure they will get to the bottom of it but I'll be staying on the 100/50 for now. Thanks Snap for the prompt service in switching plans and as per usual great customer service. I ended up switching back to 100/50 as well, although Chorus once again stuffed my order up so I was without internet for a day (twice in two weeks). Other then that I guess things are back to normal (But I still can't even watch twitch.tv on low quality). Why not just whack a different router in? Mikrotik for sub $150 could route 200Mbps. I highly doubt it is the actual UFB product that is unstable. What are Snap's thoughts so far? Snap is well aware of the disconnect problem and are trying to isolate exactly where the fault lies. There are numerous possibilities and the thought pattern at this stage, I believe, is a problem with the provisioning on Chorus's end, especially given the 100/50 works perfectly fine and stable with the same gear. As others have noted, the problem only occurs when downloading. I believe tests are being done currently in the residential field to rule out the Fritz!Box as the problem and also to run some more advanced diagnostics. Like me, we're all keen to have this product up and running smoothly so hopefully the issue will be isolated and remedied shortly. Just wondering if there was any update from Snap or any users on this issue? I see vodafone are also offering 200mbps now I wonder if they will have any of the same issues. PoHq: Just wondering if there was any update from Snap or any users on this issue? I see vodafone are also offering 200mbps now I wonder if they will have any of the same issues. I would be keen to know as well - now that I know it's happening I'm finding it quite annoying - especially as streaming doesn't seem to set it off. So is it just people on the fritz seeing this or everyone? I'm thinking of ditching my fritz on vdsl for something reliable and this being the fritz would help validate that decision. richms: So is it just people on the fritz seeing this or everyone? I'm thinking of ditching my fritz on vdsl for something reliable and this being the fritz would help validate that decision. 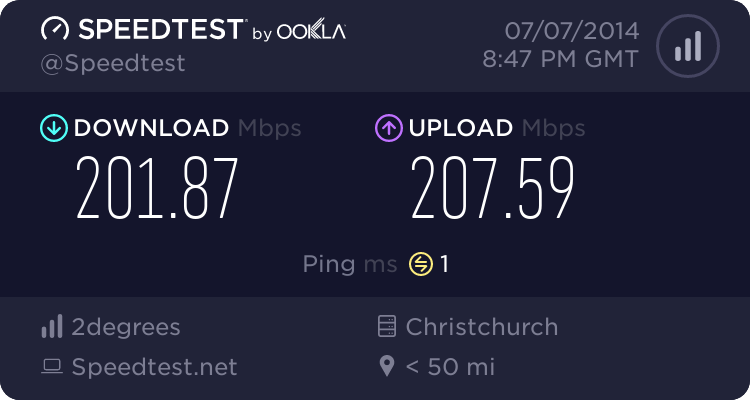 UFB issues and VDSL are rather different ild say..
long as you stick to the older firmwares, the fritz is rock solid on VDSL.. the new ones are absolutely unstable. Anyone from Snap able to update us on how it's going resolving these issues? 21 disconnections today alone, 78 for the month so far. I'll have to look at switching back to the 100/50 if it keeps up, the last week or so has been noticeably worse. Interesting. Thanks for letting us know. Can anyone else confirm this as I'd like to upgrade to 200 again. Anybody from Snap care to comment / confirm it's fixed.